We are delighted to announce that the Cooperation Organization for Vocational Education, Training and the Labour Market (in Dutch: SBB) has appointed OOS International as accredited work place company for marine engineering on board. The organization obliges secondary vocational education students to practice their education at companies that are an excellent training example for the industry. 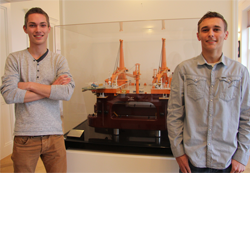 In cooperation with Maritime Institute De Ruyter in Vlissingen OOS International will place two fourth year students of the marine engineering education after each other for a total internship of seven months on board of the OOS Gretha. As students are having difficulties finding the right work place company, OOS international is proud of providing an important contribution to the development of these young professionals offering them an internship at our company.